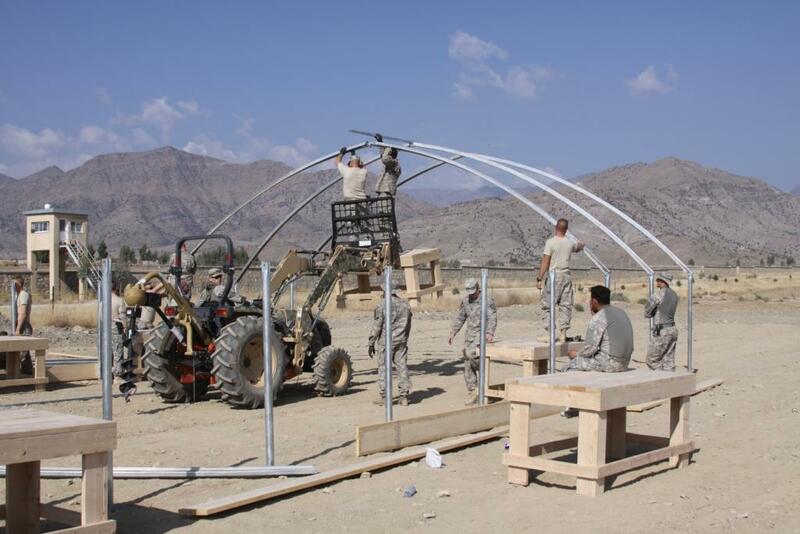 From the Statehouse to the Fields...of Afghanistan: We built it, but will they come? A common term you'll hear members of today's armed services use is "train the trainer". This goes right along with the old adage of teaching a man to fish... As members of the 3-19th Agribusiness Development Team use agriculture as a tool in the larger counterinsurgency effort, this concept of training takes the utmost importance. Many readers of this blog ask if we are working directly with Afghan farmers- at times we are, but that is not the goal. 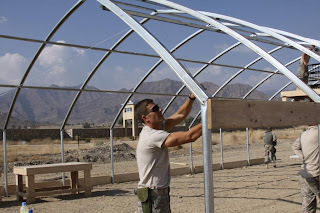 Agricultural Extension Agents here in Afghanistan, just like we have back home in the United States spread throughout each of our counties, make up the target audience for our training efforts. The Khowst Province of Afghanistan is home to numerous military installations. In addition to our farm on FOB Salerno, the 3-19th ADT also maintains acreage over on a joint Afghan/USA base in the western portion of the province. Camp Clark sits within the grounds of Camp Parsa, an Afghan National Army (ANA) basic training base. While there are a few handfuls of US troops stationed on Camp Clark, no members of the 3-19th are permanently assigned to keep up with the endless daily duties a farm requires. Instead, a small contingent of 2-3 soldiers makes the 40 minute trip from Salerno to Camp Clark about once a week to maintain operations. One of the major obstacles to providing agricultural training is security. This seems to be a common theme and is ultimately the reason military members are here in an agricultural role. While FOB Salerno is obviously one of the most secure areas in the entire province, this also means it is one of the most difficult places for the agricultural extension agents or other farmers to gain access to. Enter Camp Clark- because Clark is located within an Afghan military installation, local nationals feel much safer attending a workshop here as opposed to over on FOB Salerno where if the wrong person saw them entering it could cost them their life. about those mountains in the background? 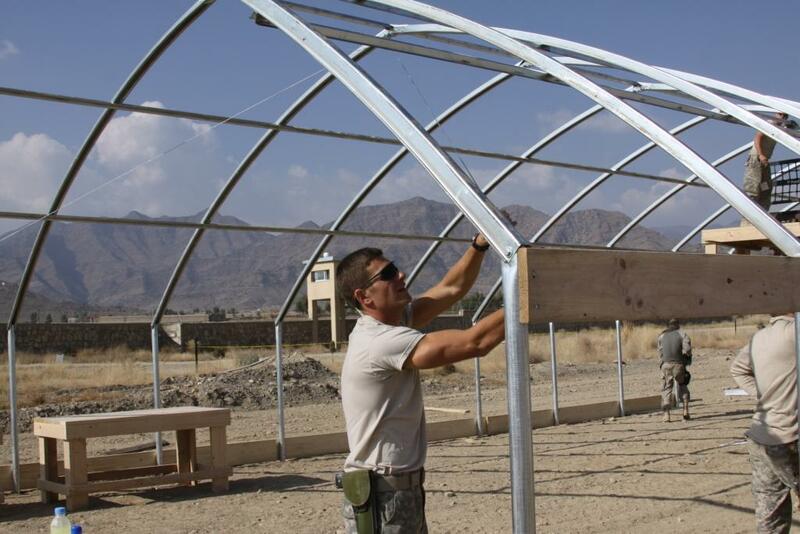 One project that our team has started promoting is the construction of greenhouses. I have been here in the country now for a little over three weeks and have witnessed bright sunny skies on literally every day. The sunny skies mixed with a very moderate temperature that has averaged between 75-80 degrees each day make for nearly ideal greenhouse conditions. With the help of our translators, we are able to provide assistance on the construction of a greenhouse as well as technical expertise on what might grow best inside this giant bubble that just grew from the earth. Today's construction project drew many inquiring eyes; even from the Camp Parsa Commander, Colonel Abdullah. He stopped by to check on the construction project, ultimately giving us his blessing and even offering men for labor if we needed any more hands. 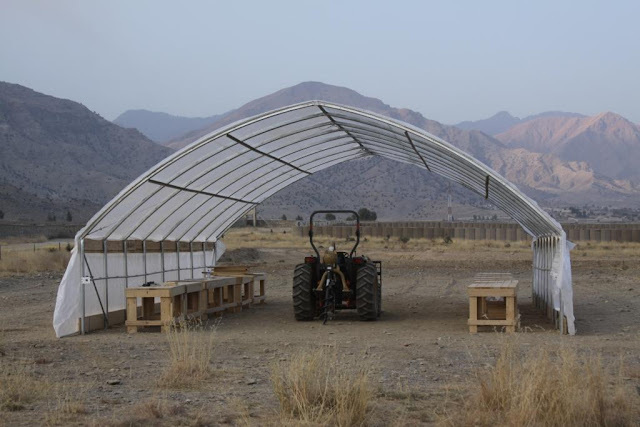 Just over seven hours from the time we arrived on the camp; this barren, rock-filled area had now been transformed into a new point of commerce for Afghan agriculture. Building this structure is only one part of the battle, filling it with plants and most importantly inquiring minds is the larger fight. Our intention is to work through the local agricultural extension agent to host training sessions for local farmers and villagers, let's just hope they feel safe enough to come.